February | 2015 | Relaxed. Transitioning. Natural. Beautiful. Water, Polyquaternium-11, Amodimethicone, Panthenol, Hydrolyzed Hair Keratin, Hydrolyzed Glycosaminoglycans, Sodium collagen Amino Acids, Cocoyl Sarcosine, Wheat Germ Fatty Acids, Linoleic Acid, Linolenic Acid, Arachidonic Acid, Sorbitol, Wheat Germ Oil, Jojoba Oil, tocopherol, Sulfur, Tallowtrimonium Chloride, Citrci Acid, Polysorbate-80, Nonoxynol-10, Aminomethyl Propanol, Dimethicone, Copoylol, Acetamide MEA, PPG-2 Methyl Ether, Fragrance, Quaternium-15, Methylparaben. Wash hair with Aphogee Shampoo and towel dry. Apply ¼ to ¾ ounce of Pro-Vitamin leave-in Conditioner onto hair depending on length and thickness. Comb thoroughly. Hair should be evenly damp, but not over wet. Blow dry on low heat setting or air dry naturally. Style as usual. This leave-in may be used daily, before styling, or setting. 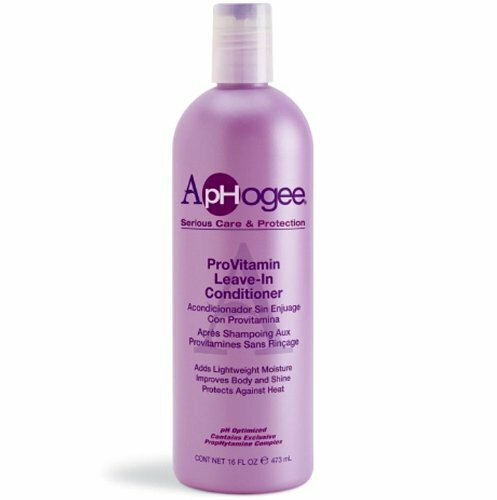 According to the label, ApHogee’s Pro Vitamin Leave-In Conditioner fortifies limp, lifeless hair, increases fullness and provides superior body, strengthens hair with Panthenol Pro-Vitamin B5, allows all hair types to support styles better, is pH balanced to seal the cuticle, detangles, enhances color and highlights, springs permed hair to life, and is essential for use with heat styling tools. This conditioner has a fragrance reminiscent of coconuts, just like ApHogee’s 2 Minute Reconstructor. So, if you are not a fan of tropical scents, beware! In addition, this leave-in is quite watery. I know this is a water-based leave-in, but it is not what I expected at all. Even after “a good shaking,” it was still very runny. Moreover, the fact that this water-based leave-in comes with a pour spout instead of a spray nozzle is just odd and downright silly! It makes application messier than necessary. I also felt like I wasted product because it was hard to control how much I poured out of the bottle. And, once I did manage to pour a reasonable amount out, it was still difficult to apply it to my hair. I kept staring at my cupped hand, trying to figure out how not to spill the product all over my bathroom floor! I ended up purchasing an empty spray bottle to pour the product into to make it easier to use and for product conservation (e.g., to avoid applying too much of the product in one sitting). Thankfully, this leave-in isn’t sticky and never created any build-up, even when used daily. However, this product, for me, was just OK. I wan’t really impressed. I didn’t feel like this conditioner detangled my hair one bit. In fact, I did a comparison test, using this leave-in every day for a week while styling my hair (prior to bed) and then using plain, distilled water the next. Good ole H2O won every time! This was very disconcerting. Nonetheless, I don’t like to be wasteful, so I’ve laboriously emptied my bottle. After using this product for several months, I have yet to see any improvement in the condition or overall health of my hair. Some consumers suggested adding water, natural oils (i.e., castor oil or olive oil), and essential oils (i.e., tea tree, rosemary, lavender, peppermint, etc) to this leave-in to make it more useful. But, honestly, instead of doing all of that, I would rather just make and use one of my own DIY leave-ins like my multi-use beauty spritz or my easy homemade leave-in conditioner. It’s less expensive and more effective! Needless to say, I WILL NOT BE REPURCHASING!! !